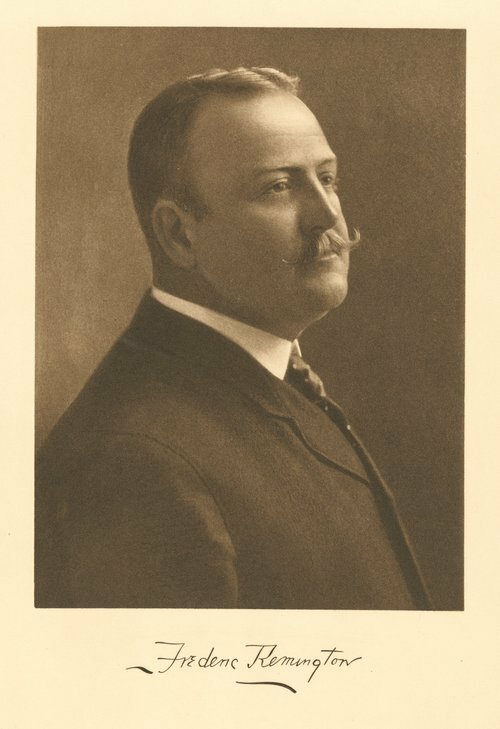 One of this country's best documentary artists of the Old West, Frederic Remington cannot really be considered a Kansan. However, his years here did help shape and inspire his artistic vision of the American West. Born in 1861 in Canton, New York, Remington took art classes as a freshman at Yale. He decided he was less interested in still life in his art training and more fascinated with action drawings. At the age of 19 he decided to head west in search of frontier adventure and fortune. There he found the inspiration to become an artist. Remington lived in Kansas from 1883 to 1885. He first invested in a sheep ranch near Peabody. He continued his sketching, but soon found he disliked ranch life. 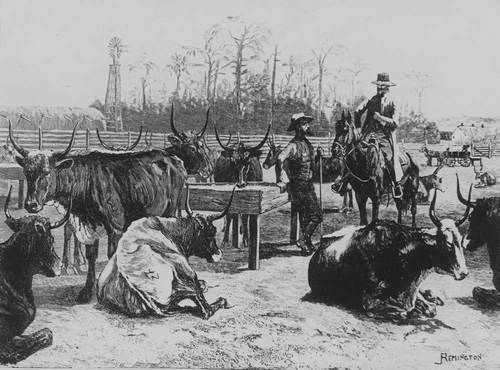 Remington sold his interest in the ranch and returned east to acquire more money. He returned to Kansas City and bought a hardware store, also becoming a silent partner in a saloon. In 1884 he married Eva Caten. Unhappy with Remington's cartoons at the time and his involvement in the saloon, she returned to New York. Alone amid failing businesses, Remington was motivated to rely on his sketches for income. Virtually a self-taught artist, Remington was soon receiving national acclaim for his paintings and illustrations. In 1886 Remington's work was reproduced on a full page page in Harper's Weekly. The magazine sent him to Arizona as a correspondent to cover the war against Geronimo. Although he did not encounter the Apache leader, he took photographs and made notes about the landscape and its coloring. During the early 1890s Remington illustrated books and articles by such famous authors as Theodore Roosevelt and Francis Parkman. By 1895 Remington had begun sculpting the bronzes of cowboys and American Indians for which he is now legendary. He died at the age of 48 in 1909.